Considerable research is taking place with research articles, books, conference papers etc. The Vedic Mathematics Research Group is for anybody interested in following or contributing to the development and research of Vedic Mathematics. The aim is to act as a conduit for like-minded people to share their insights, questions and discussions concerning the VM sutras and their applications. The group will also keep you informed with any ongoing VM events such as workshops, talks or seminars. You are invited to join the LinkedIn Group: Vedic Mathematics Research Group. These researchers are listed in alphabetical order by surname. If you would like to be added please let us know. We support those who are doing research into Vedic mathematics and can put up material on research currently in progress and/or publish in the Vedic Maths Newsletter. Obtained a PhD in Numerical Analysis in 2010. His research interests are Vedic Mathematics, Iterative Methods for solving nonlinear equations, fractals and Pythagorean Triples. He is fascinated by new and fast methods. He recently proved that the excess of the sum of the smaller sides of a right angled triangle over the hypotenuse is always even and using this property he derived the old two-fraction method for generating Pythagorean Triples. He also developed a general method for squaring and extended Tirthaji cross-multiplication method for solving systems of linear equations. Visualization Research Programmer, Illinois Simulator Laboratory at Urbana, Illinois, USA. Has been teaching and researching Vedic Maths since 1980. Author of five books, Vedic Mathematics for Schools, Book 1 - 3, and The Curious Hats of Vedic Maths, Books 1 and 2 (pending publication in 2014). Has conducted numerous workshops and seminars on Vedic Maths in the UK, India and the USA. Has run 8 public courses on VM in London. Designed complete mathematics curriculum using VM principles. Researches include, how to use VM in a school curriculum, how to extend the application of the VM sutras into mathematics not included in BKT’s book, and how to address the potential universality of the sutras. 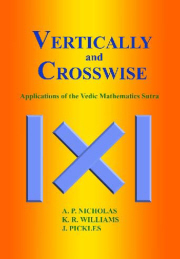 Developed use of VM sutras in coordinate geometry, vector algebra, binomial expansions and other topics within pre-university mathematics. Started Vedic Maths Research Group on Linkedin. B.E. ( Computer engineering), Maharashtra, India. Fascinated by mathematics since from childhood. Left two job offer to pursue research in mathematics. Invented one new multiplication method, universal divisibility test and efficient algorithm / method to compute any root of number or polynomial in single line. Research on speeding up programming time using Vedic techniques. See Issue 60 of the newsletter. See also another article - here. Dr Kapoor has written many books on Vedic Mathematics. His work is profoundly geometric involving the understanding and use of multi-dimensional spaces. He is involved with the dissemination of Vedic Mathematics in India and is a prolific writer and teacher. Vedic Mathematics and Natural Computation Research and Development in Ireland includes a diverse range of topics, from developing a multimedia approach to teaching using animations to exploring the language of computation using natural language, to developing a deep correlation between aspects of gaelic knowledge, modern computational physics, and vedic knowledge. Recent research reveals that the integration of these three great traditions of knowledge will point in the direction to develop the Theory of Everything in Physics, with implications for the Continuum Hypothesis in Mathematics, Completeness in Computation, and a realisation of the goal of a simple and complete approach to Knowledge. Interested in the special theory of relativity, the foundations of geometry, the solution of ordinary and partial, linear and non-linear differential equations, evaluation of determinants, inversion of matrices. Currently working toward the Ph.D. degree at the Department of Computer Science and Engineering, University of South Florida, Tampa. For one year, he was a Research Assistant in the School of Computer Engineering, Nanyang Technological University, Singapore, where he was engaged in reversible/adiabatic computing at metal-oxide-semiconductor level. His current research interests include reversible logic, conservative logic, emerging technologies, Vedic mathematics, design of efficient arithmetic units, design of field-programmable gate array (FPGA) architectures for emerging nanotechnologies, and FPGA-based system design. Interested in promoting all aspects of Vedic Mathematics.